In a previous blog I mentioned how to tell the Google Chrome browser to search by using a different search engine (or a specific search URL). I created a quick and easy way to search SAS conference proceedings and to search Visuwords for definitions of words. But, what if you've already found an interesting page and it has a word on it that you'd like to look-up or search? Well, that's easy to do in Chrome too. Just right-click and select Search Google For <Word>. By default, no other web site (or URL) is offered. 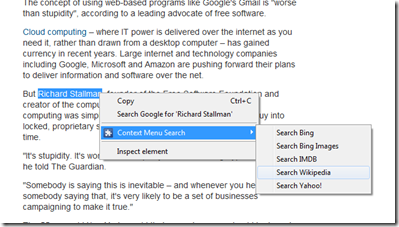 However, by adding the Context Menu Search extension, we can add multiple alternate search engines. To do this, visit the Chrome Web Store and search for "context menu search"
When you get the search results, you'll see "Context Menu Search from ashutoshdwivedi.com" at the top of the list. And there you have it. You can now highlight words and then search for them with specific search engines and URLs. The ability to do this for Visuwords and Wikipedia is very useful.